I hit the jackpot when it comes to in-laws. 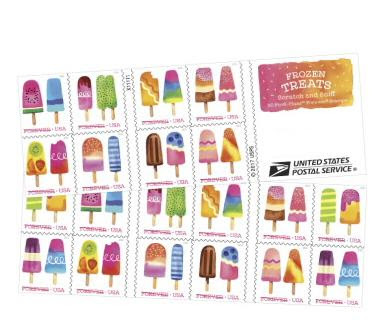 During a recent phone conversation my FIL asked if I had seen the new Frozen Treats stamps yet - and mentioned that they had a scent added to them. He had recently been to the post office and the post mistress had shown them to him. I replied that I had not but would definitely check them out. Just days after this conversation, I get a card in the mail from my MIL. Along with a sweet kitten and flower imaged card she had tucked in a package of the new scratch and sniff stamps. What a thoughtful surprise. I immediately thought of a card in thanks. I put it in an orange envelope and used the orange/yellow/pink combo stamp to mail it. I think they'll get a kick out of it. Oh what a wonderful post, Cat! Super sweet in-laws & such fun happy mail! They will love getting that cute card with the matching stamp! Yes you did hit the jackpot, what a thoughtful gesture from your inlaws! We don't have fun stamps like that in Canada but maybe one day! They are going to love that card--so yummy! Wonderful card design! Yay for fun stamps!